The Travelon Anti-Theft Urban(r Backpack makes an exceptional commuter and travel bag. It features clean, modern design with thoughtful organization. The roomy main compartment features a padded and fleece lined compartment for your iPad(r or tablet. A separate front zippered compartment features RFID blocking card and passport slots, a zippered wall pocket, a pen loop, and a tethered key clip with LED light so you can stay organized. There’s a padded fleece lined compartment for your laptop to 15.6. The exterior has front zippered pocket and mesh expansion pocket for a water bottle. The air mesh back panel and straps are comfortable to wear. PATENT: http:www.travelonbags.compatent-marking . 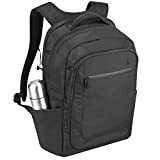 This entry was posted in Luggage and tagged AntiTheft, Backpack, Black, Multipurpose, Travelon, Urban by Perfect Vacation. Bookmark the permalink.